The plan for winning Helmand province was plotted out for me by one of the commanders on a decorative square tablecloth with a paper cup representing Lashkar Gah. Diagonally across one of the squares, just 35 miles north east up the Helmand river, lies the town of Gareshk. It was explained that these two towns were the focal point of the British effort to help the government bring security and development. If they can control them both, and the road in-between, they can create the space and the security for development agencies to get aid projects going that will persuade distrusting locals they offer a good future and are worth supporting. It's the first big "ink spot" on a blotting paper representation of Helmand - not my words, but a military theory, which goes back decades, and is bandied about in all the top brass planning rooms. Secure the main district centres and the ink gradually spreads out until all the spots join up and Helmand is won. Or so the theory goes. 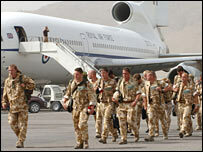 But dropping too much ink, in too many places, too quickly is what has overstretched the British forces in Helmand and brought on the need for reinforcements, 120 of whom have already arrived in the province. The commanders could do little else - various local government headquarters were in danger of falling to Taleban fighters (and local militia) - how would that look with thousands of British troops just a few miles away? Platoon houses have been set up and are well protected in the district government compounds, and patrols are being carried out, but these are defensive positions - there hasn't been the manpower to take the offensive - the Taleban have taken on that role. The worst fighting has been in Sangin - the next district up the Helmand river from Gareshk - and the place where the British forces have suffered all six of their fatalities in less than a month. To understand the challenges facing this British deployment and how difficult the mission is going to be, Sangin is a good place to start. "If you want to buy opium, sell opium, or hire a car to traffic drugs across the border you'd go to Sangin," it was explained to me. It's the town where the sound of heavy gunfire punctuates the night, where rockets and mortars often fill the sky and where a small unit of the 3 Para Battlegroup has been fighting pretty much daily now for two weeks. And narcotics is driving in the insurgency in crucial crossroads town. "Drugs are vital to the Taleban funding effort at the moment and the connection is very, very strong," said Nick Kay, the UK regional co-ordinator for southern Afghanistan. "They receive funding from the drugs industry and they provide protection to drugs smugglers and farmers growing poppies. The Taleban are hugely entwined with the drugs industry in this province and in the whole of southern Afghanistan." And there are even more levels to cloud the situation further. The deteriorating gangland battles between drug running families and tribes have given the Taleban fighters their chance to monopolise on the instability. In simple terms, the two warring tribes are the Ishakzai and the Alikozai and they have swapped roles a number of times between being the cop and being the robber. During Taleban rule the Ishakzai were favoured; when the Taleban fell the Alikozai re-emerged and got their revenge by charging high "taxes" on drug smuggling. Fourteen members of the Alikozai were killed a few months ago, chaos ensued and it's that which is now being exploited by the Taleban. It's all very well talking about bringing government control to these remote areas, but all people know of governance is corruption, extortion and drug running. The new governor of Helmand is not a warlord and he now has a good, clean police chief, but all levels of local government have to be cleaned up if people are going to trust the administration, and the British forces protecting and assisting them. This is a complex situation, and the British effort here is having to step very carefully around centuries of tribal disputes and politics soaked in opium - while at the same time standing in the line of fire. Boots on the ground is one thing, but time for this all to be unravelled is the biggest investment Helmand province needs if the mission is to succeed.